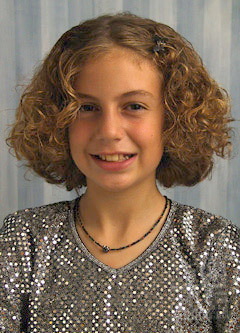 This small page is intended to share a few ideas and findings about flash photography with fellow owners of the Canon Powershot G1 and Pro90 cameras. If you have a high-end Powershot like a G2 or Pro90, or a new DSLR like my EOS 300D, chances are you consider yourself an advanced photographer of one stripe or another  or have ambitions of being one. Either you're moving up to a more-capable digicam, or you're a film shooter willing to give digital a shot. Chances are, if you're like me, you have a bunch of other camera gear lying around the house and you'd like to use some of it with your new Canon. The Powershot can't use those old motor drives or the battery of 35mm manual SLR lenses, but what about your strobes? The hotshoe looks like a standard EOS setup, and in fact that's just what it is, for the most part. The G1/G2/Pro90 are (more or less) EOS "Type A" cameras (not to be confused with the EOS A2 or the old A-1...), and so they support Canon's E-TTL dedicated flash system. The dedicated "EX" flash units are very flexible (though not all features, sadly, are available on all Powershots  though the G3, at last, seems to have complete support, as do all EOS SLRs), and permit a host of useful effects  but they're also pricey and lock you into a highly-proprietary flash system. The E-TTL system also requires an additional small delay while the system preflashes and evaluates the scene (more E-TTL info). What about using non-Canon flash units? How about hooking up the Powershot to your old Vivitar, Sunpak, pre-EOS Canon, Nikon, Balcar or K-Mart flash unit? Will it work (probably)? With E-TTL (not yet, even for the very new Metz 54MZ-3, though Metz is working on it  but maybe yes for the top-of-the-line ProMaster FTD 7000m or Sigma's new EF-500 Super)? Is it safe (yes, if you follow these steps)? What about mixing Canon and non-Canon strobes in the same shot (no prob)? How should you set the camera (read on!)? Some old flash units will do bad things to your Powershot camera. Never put a strobe onto the Powershot (or any other modern electronic camera, such as, say, an Elan 7), without first checking to be sure that the strobe's trigger voltage is within an acceptable range for the camera, and that the strobe doesn't have any "extra pins" that were designed for a different flash system. Hotshoes can have a number of pins. The G1/Pro90 has several pins, but the important one is the big one in the center  that, along with the metal rail along both sides of the hotshoe, combine to create the flash-triggering circuit. Every "standard" hotshoe, from every manufacturer, will have those same two connections. 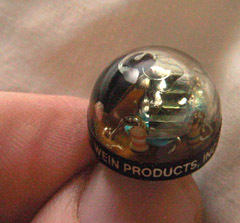 All the other pins are there to send extra signals back and forth between camera and strobe, according to proprietary methods set by each camera manufacturer. If your non-Canon strobe has more than one pin, those extra pins may be hazardous (or at least might confuse both the camera and strobe). Strobes made for EOS and older Canon cameras will be safe enough in this regard  but strobes with extra pins made for other camera makes like Nikon, Olympus, Minolta etc may cause odd crossed circuits in your camera. Generally it's better to leave such "dedicated" flashes well enough alone (a few flashes, like the better Sunpak and Metz strobes, can be altered by the addition of special hotshoe modules). You may want to try masking the extra pins so that they don't make electrical contact  either by covering them with tape (if it will fit) or by connecting the strobe via a hotshoe adapter like the Wein Safe-Sync. The trigger voltage is the amount of voltage between the strobe's two primary hotshoe contacts (center pin and rail). This voltage will be discharged by the strobe through the camera's hot shoe when the strobe fires. Canon specifies no more than 6V trigger voltage for EOS cameras, including the Powershots (this was verified by a phonecall to Canon USA's tech guys... but what about the ISO spec, that specifies 24V? And as late as septemebr 2001, Canon Canada claimed: "There is not a maximum voltage requirement for the hot shoe terminal on the PowerShot G1." Inconsistent to say the least  not just with one another, but with the real-world experiences of shooters). All Canon strobe units that I've tried trigger within this 6V range, but some older or bigger non-Canon strobes can have voltages ranging in the hundreds of volts! When a high-voltage strobe is used, the capacitors used by the camera to trigger the strobe can be progressively damaged. You might be surprised to discover that some rather small, innocent-looking strobe units from yesteryear can deliver high voltages. For example, my old Sunpak Auto 322, powered by nothing more than AA batteries, delivers a finger-zapping 227V. Needless to say, I'm not putting it on my G1! 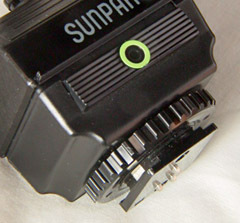 Canon "A"-style shoe, on Sunpak 555. Extra pins in back match those on the Powershot and are harmless. Why Are Newer Cameras in Danger, but not Old Ones? Once upon a time, all camera shutters were triggered mechanically. The flash switches were mechanical switches, made of metal. Cameras from the 1950's-70's even have two different flash settings, each with minutely different timings: "X" for strobes, and "M" for flashbulbs (which needed an extra 1/250th of a second or so to ignite). Modern electronically-controlled cameras use a thyristor capacitor, a solid-state device that switches according to voltage potentials. It switches on and off much more quickly than mechanical switches, making it excellent for electronic control, especially of short durations. But it's also susceptible to problems that weren't present in the previous generations of cameras. First, check the list of strobes and their trigger voltages that I'm keeping here on Botzilla, or just call up the manufacturer of your strobe unit, and ask them. If the information isn't readily available, you'll need to check it yourself (Then be sure to post a message or email me with your discoveries, so I can add them to the list!). 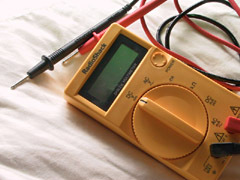 To check an unknown trigger voltage, you'll need a voltmeter or electrical multimeter. Digital meters are nice but an old analog meter will do just as handily, as long as the input impedance is 10 megaOhms or higher (I have one I bought 15 years ago at Radio Shack for $9 new, and a newer RS digital model that cost around $30). To measure the voltage, turn the strobe on, let it charge up, and measure the voltage between the two primary contacts on the hotshoe. You can measure the strobe's hotshoe voltage by comparing the center pin of the hotshoe (+ positive contact, typically coded red on voltmeters) to the conducting element inside the shoe (- negative or "ground" contact, typically coded black). The illustration shows a typical negative contact, on the center post of the strobe shoe  that metal square recessed in the shoe. 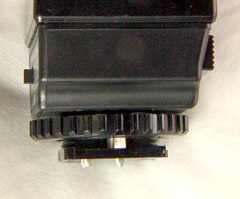 Some flash designs (e.g., some Canon strobes) might place it a little differently, but all of them work the same way  the (- negative) part of the hotshoe connects to the camera's hotshoe rail, and the (+ positive) pin will make contact with the large round connector at the center of the camera shoe. Sometimes, the (- negative) center post can be hard to reach with the meter probe, as it was my old Sunpak 322. As an alternative, the strobe might have an extra "PC cord" connector  if it does, you can measure the trigger voltage there, instead. 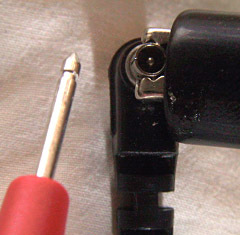 The illustration shows a PC connector held by a meter clamp. The outer cylindrical shield of the PC connector is the (-), and the center post is the (+). Touch the red lead to the center pin to read the voltage. PC conectors are small  don't be too surprised if your fingers slip and you give yourself a little ZAP. Happily, I don't know of anyone ever electrocuted by AA-powered strobes (a strong zap might be your first clue that your strobe's voltage is too high, however....). Once you've measured the voltage, be sure to mail me your results  I'll add them to the list of common strobe unit trigger voltages here (a useful list for users of any newer electronics-driven cameras). Recently, it's been pointed out by Tuan Tran that the electrical polarity of the strobe trigger circuit could be significant for electronically-triggered hotshoes like those used on EOS and Powershot. A few strobes won't fire at all  and seem to have polarities that are the reverse of that used by Canon (center post positive). Potentially, center-pin negative flashes will always fail regardless of their trigger voltage! Just how many such strobes really exist in the world is still an unknown as of this writing, but we'll be looking into it. 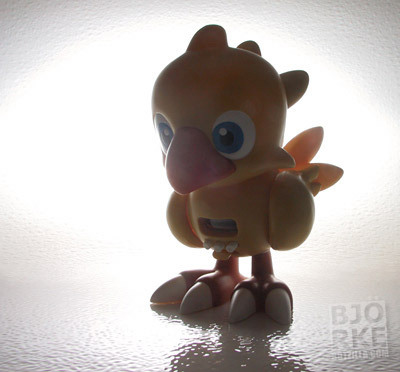 Use the flash as a strobo-slave. More on this later. Get a Wein Safe-Sync H for about $40. Wein makes a little accessory that plugs into your camera's hotshoe, and delivers a PC-cord strobe connection on the front (also handy for strobes that don't have hotshoes!). The Safe-Sync reduces any trigger voltage to a safe 6V  just right (a few electronically-inclided people have built their own safe-sync setups, using optoelectric couplings, for as little as one or two dollars). Built your own version! "Brian Z" has designed and tested his own electrical isolator, and shared his knowledge on the web. See http://repairfaq.cis.upenn.edu/Misc/strbfaq.htm#strboaof to see his completel instructions. So What Damage Have I Done Using a 70V Flash Unit for Three Weeks? I wish I knew exactly! Along with the query about ISO compliance, I'm currently trying to get a more comprehensive answer from Canon on what long-term damage can occur to the Powershot, and what, if any, safeguards are present in the Powershot cameras themselves. All their U.S. techs could say was that burnt-out flash thyristors are a common EOS repair task. The G1 manual says turn the camera to M mode, select an aperture, and set the shutter speed to 1/125 (though not clearly worded, Canon claims 1/250 synch speed for their own E-TTL Speedlites, but 1/125 for other brands. I shoot 1/250 with my Sunpaks without trouble  your mileage may vary). Following Canon's directions will work, but it does have a potential downside, and won't always work. First, suppose your strobe indicates f/8. You set the camera manually to f/8 at 1/125th. The thing is, you're shooting at a party in the evening and the ambient-light reading would have been 1/4 second at f/2.0. The ambient setting is nine stops below your manual-mode selection. The Powershot's LCD display will follow the exposure you've set manually  and since you've assigned an exposure that's 9 stops darker than the "base" exposure, the LCD will essentially be black. So you won't be able to use that monitor much for manual focus or framing  you'll have to trust the optical viewfinder, if you have one, or prefocus and hope for the best (fine for still life, but tough for portraits or an indoor basketball game  hope you weren't using a teleconverter!). I've come to be fond of an alternative method for the G1, not mentioned in Canon's manual. Instead of setting the camera to "M" mode, I set it to "Av" (aperture-priority auto). The f/stop value is shared between "M" and "Av," so it's easy to switch between the two. The trick: I set the exposure-compensation to underexpose by a full two stops. This means that the camera might well set itself to, say, 1/2 second or even longer exposures, and that some of the ambient light will affect the shot  but it also means that the LCD viewfinder can be used for focusing and framing, though the exposure will be dominated by the strobe. If there's too much light from the ambient exposure, I can always switch back to "M" easily enough, but I've found those cases to be rare, at least for me. Using this technique, it's straightforward to use the Powershot with almost any "regular" automatic or manual strobe. Of course, what we're really doing is using a form of "slow-synch"  if there's too much motion during the non-flash portion of the exposure, it may create distracting streaks or "blur halos." Like any trick, it's useful in many situations, but not every situation. (Rare "gotcha": The powershot has a sensor to detect that a strobe is in place  a little switch near the right front of the hotshoe. If your strobe doesn't close this switch (unlikely, but possible), be sure to turn off the Powershot's built-in strobe when using an external strobe, so that you don't find the camera trying to "outsmart you" and adding unwanted extra flash to the picture. Press the flash-select (lighting bolt) button until the "no flash" indicator appears on the top LCD or the monitor. For most users, this should never be a problem  the flash will be detected in advance and the internal strobe will be disabled). Second, and this problem is more insidious: sometimes the G1 strobe exposure may say it's correct, but it's not. You may think you've set the camera to f/5.6, but it may really be shooting at f/2. Apparently, manual strobe triggering isn't completely timed correctly in the G1 (and the Pro90? Please check, someone!). The mistimings only occur when certain shutter speeds, zoom settings, and apertures combine, and only for some strobes (my Canon 550EX is immune, but even Canon's 380EX seems to be susceptible). Basically, the lens will remain wide open during flash exposures between 1/10sec and 1/500sec at zoom angles of 12.5mm or less (J.C. Bagley also reports this problem, using Canon strobes, but for angles of less than 10.8mm). When the shutter and zoom combine in those ranges, the lens will always be wide open during the manual flash exposure  yoiu may have set the camera to f/8, and it thinks it's shooting at f/8, but the lens was really still at f/2 when the strobe went off. Setting the shutter to 1/10sec or slower appears to work correctly, and 1/500 or higher also seems to be okay, despite Canon's assertion in the G1 manual that non-Canon strobes should not sync at speeds higher than 1/125. Why? Beats me. There seems to be a slight difference in strobe timing for the EX strobe units  when a 550EX is used as a manual strobe, the exposures are correct, but not when a non-Canon strobe is used (even the 380EX can have trouble syncing). Annoying? Yes. Can it be worked around? Yes... but it's a barrier that you have to keep in mind. What About the Firmware Update? In February 2001, Canon changed the G1 and Pro90 firmware. This was followed by another flash-related update in June 2001. 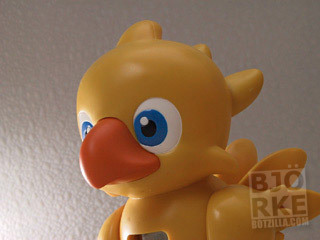 Oddly, it seems that some non-Canon strobes, that worked well before, will no longer sync properly with the Powershots! Canon's comments about this problem have been... well, less than encouraging. They seem determined to make everyone buy Canon strobes. 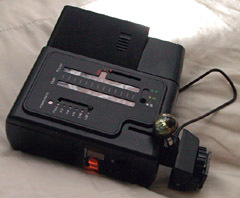 The illustration shows my Sunpak Auto322, the old strobe that I banned from ever gracing the G1 hotshoe. Yet I use it all the time with my G1  it's a great little strobe with 5 varying manual f/stops, a wide range of automatic exposures, swiveling head and a rotating mount. Well worth $20. How do I use this dangerous device with the Powershot? As a slave. I usually use the classic little button-shaped Wein "peanut" micro-slave triggers  they're extremely dependable and durable and plug into a PC cord (you can see the slave and PC cord in the photo). There are plenty of other slave brands, and most work about the same way  I recently bought a bunch of $8 no-name hotshoe slaves (no identifier other than a sticker marked "Taiwan"), and they work perfectly. All slaves quickly trigger the strobe when they sense another strobe firing. It's tempting to think you could use the Powershot's built-in flash to fire slave strobes  this is a very appealing idea and in fact it works very well with many other cameras that have built-in strobes. It's not dependable with the Powershot, however. The Powershot's built-in flash uses Canon's E-TTL metering system. E-TTL fires twice for a single exposure  once at low power to meter the scene, and then once at full power (or whatever) to expose the image. Upside: very good range of exposures. Downsides: (1) a delay between the time you press the shutter and the exposure, and (2) the first flash will set off your slave units, which will fire and overexpose the meter reading but be unable to recycle quickly enough to make the second, real, exposure. The safest way to use optically-slaved strobes with the G1 is to trigger them from another external unit. I typically use my old Canon 199A (a speedlite made in the era of the A-1) for this task  it can be swiveled off to bounce from the ceiling while the slave units do the bulk of the work (recently, to avoid any chance of being bitten by the wide-angle mistiming bug, I've been using the 550EX instead. Pretty pricey for a slave trigger!). (There's a second "gotcha" to using the built-in strobe  if you're using a lens adapter like the Canon 58mm or even the smaller LensMate adapter on a G1, G2, or G3, there's a good chance the adapter will throw an undesireable shadow across your shot when using the built-in strobe a small one for the LensMate, a bit bigger for the Canon, and a huge shadow if you're using the Canon with the auxiliary wide lens!). Gauging flash exposure can be very tricky. I have a nice Sekonic 508 flashmeter, but with the G1 I've almost never used it. 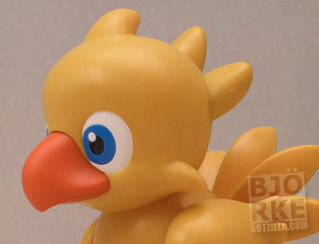 Instead, it's much easier to just experiment, take a look at the preview in the camera's LCD, and keep shooting. To me, this quick feedback about strobe images is one of my favorite aspects of digital photography. With the digital, you're much more free to run the limits of exposure up and down  hard-to-meter shots like the one here become easy to quickly setup, shoot, and evaluate within a minute or two. Happily, most strobe sources emit very little light in the UV and IR bands  this makes them doubly useful, because strobe-lit images exhibit little or no chromatic aberration  a real blessing for any digicam. The Powershots have a "flash" white balance setting, but it's often not the best choice for flash shooting the "flash" setting is actually a form of Automatic white balance, tuned to optimize for flash exposure (which may mix the color of the flash with unpredictable ambient light, or may be colored by bouncing flash from colored walls). If you want prediuctable flash color, use the "daylight" setting, just as you would do with regular film (or shoot everything in RAW mode, and sort out the WB later). Total setup/shoot  about 5 minutes (and it looks it, I know...). What About the ISO 10330 Specification? Recently, Rupert Vogl gave a ring to Metz and asked about strobe voltages. He was directed by them to the DIN/ISO Standards Doc #10330, which you can get as a .pdf from the ISO or the American Standards Institute for a paltry $46. John Astleford, Jr was nice enough to check meters, not just strobes, and showed that input impedance can be a big influence on measured results  unless the impedance is high enough, the results may be measured too low. Gerald Kray likewise sent some calculations showing that even a 20Kohm analog meter may measure incorrectly, and recommends a good quality digital meter instead.